This weekend, spend QT with your guy in this picturesque place in Antipolo that houses breathtaking landscaping, yummy organic food, and the most interesting works of art. The same old date places can get old. Sometimes, you need to breathe new life into your relationship by driving up where there's literally fresh air to be had--not to mention fresh new sights to see and interesting new culinary delights to try. So, before the rainy season officially brings constant flash floods, hop into your boyfriend or husband's car and go on a road trip date this weekend! If Tagaytay, Subic, or Batangas are either too commonplace or too far for you, you may want to visit good old Antipolo. It is so near, yet, of late, has been so rarely visited and explored for its wealth of date destinations. One such romantic spot that's so pretty, you can hardly believe it's only a short drive away from Metro Manila, is Pinto Art Museum. Nestled in the hills of Antipolo, beautiful Pinto Art Museum is the newest addition to the Silangan Gardens, which houses several art exhibits throughout the complex. This architectural complex is composed of interweaving exhibition spaces with high ceilings. It has a romantic rustic feel to it, which is apparent in the antique hard wood furnishings and motifs integrated into the structure. It also has touches of Mediterranean inspiration, as seen in the quaint turret, open porches, white facade, and strategically placed stylized colums. Even if you're not particularly fascinated by art, the architecture, soothing water works, scenic gardens, and view it offers will take your breath away--and will allow for lots of picture-perfect moments with your man. But when you do enter the exhibit areas, it's hard not to appreciate the works of art you'll find there. Displayed in the museum are various artworks that founder Dr. Joven Cuanang has collected from 1986 to the present, all of which showcase Pinoy artistry and ingenuity. Stroll hand in hand as you view the paintings, sculptures, installations, assemblages, and drawings done in an assortment of styles, approaches, and methods using various media. Launch the gallery to view photos of the stunning scenery in this secret garden. View the next place to see what you can feast on when you do go on a date to Pinto Art Museum (plus, how to get there). After you stroll around the place and see different works of art on display, you and your man can treat yourselves to a yummy lunch or dinner at their cafe. Their menu features a la carte dishes as well as set meals at P600, which gives you a choice of Thai tomato basil soup, spicy eggplant puree with cilantro pesto, or hearty herb and corn chowder; paired with a choice of free range chicken fillet, pan seared white fish, or coconut and cashew-crusted tofu. A choice of dark chocolate and black pepper tart, homemade cheesecake, or chocnut banana spring rolls for dessert caps the set meal. If you're there for merienda, they also serve soups, salads, and sandwiches for P200 to P230. Everything on their menu is organic, so it's healthier, but without sacrificing the richness of each dish (your man can heave a sigh of relief). You also must try their range of coffees and teas, which, at P80 to P120, are affordable, delicious, and good for you. Pinto Art Museum is located at the Silangan Gardens, 1 Sierra Madre Street, Grandheights, Antipolo City (you may call 02-6971015 or email pintoartmuseum@yahoo.com for inquiries). The thing is, it's not exactly accessible by commuting, so if you want to avoid getting lost and spoiling your otherwise relaxing date day, we recommend you take a car. If you have yet to buy one, road trips to lesser known places like Pinto Art Museum are a good motivation for finally making that investment. The best car to use for road trips is one that's fuel efficient. You don't want to throw all that cash away on gas, when you could otherwise spend it on food and other forms of enjoyment with your man. Other features an ideal road trip car must have is a hill hold and hill launch assist feature, which you can find in cars like the Ford Fiesta. This feature, which prevents your car from going backward when you release the brake to step on the gas, is particularly useful when navigating places like Antipolo, Tagaytay, or Baguio, which have steep inclines. But, the latest Fiesta model also has a cool new road trip-friendly feature: bluetooth and voice control, which lets you change the track on your stereo or iPod, or--get this--even make or take a phone call without taking your eyes off the road or your hands off the wheel! A plus for Cosmo chicks: the Fiesta has a secret compartment under the front passenger seat where you can store your favorite pair of shoes! The trunk of the car is also extra spacious, so you don't have to worry about cramming all your overnight bags or shopping bags in your car, in case you and your honey decide to stay over in some quaint inn in Antipolo or some other town. 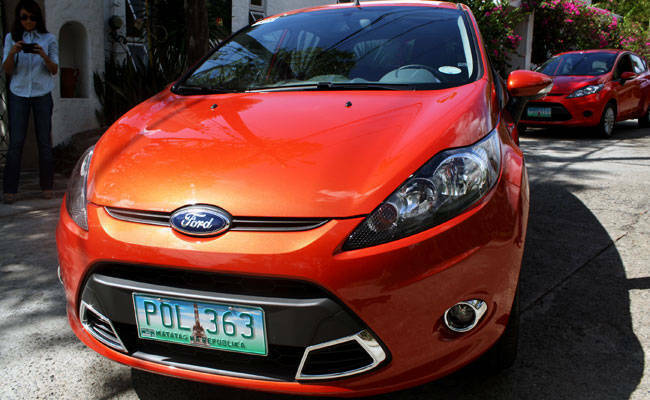 Launch the gallery for a "tour" of Pinto Art Museum--and a sneak peek at the Ford Fiesta's cool road trip features.